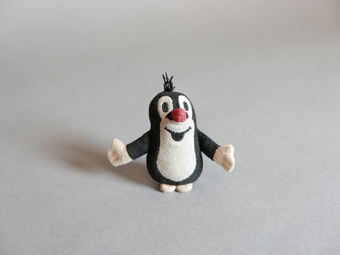 This is Krteček, or “Little Mole”, from the Czech Republic. He is so special to me, as my new partner and I chose him together at a toy store in the centre of Prague. We call him ‘Muffty’. Ever since we bought him, he’s travelled everywhere with us. He’s been to Barcelona, Ireland, Stone Henge, Newcastle (IRE). He travels with us both to work, lunch dates, long walks… everywhere! As my partner and I live far apart (he’s from Ireland and I live in Liverpool) we take turns of him when we visit each other. Muffty is currently in my custody, so I’ve brought him here today. I love this little guy so much; he brings me happiness, luck and funny memories of our relationship. I like this painting because it makes me feel that, even through all the darkness, there are some colours within and underneath.